Facebook and twitter are two of the top social media sites. As a publishers these two social network giants prove to be a great tool to kick start each of your article. But sharing all of your article on the web that comprises of several social media site can be a pain. When it comes to twitter then, tweeting same article again and again is helpful, but don't unnecessarily spam. Over-tweeting may cost you your followers. In a previous tutorial, I showed- How to auto tweet your feed updates to twitter? How to tweet your Fan page updates to twitter? Open Fan page administered by you. From the admin panel, goto 'Edit Page' > 'Update Info' > 'Resources'. Click 'link your page to twitter'. Click the 'Link to Twitter' button. 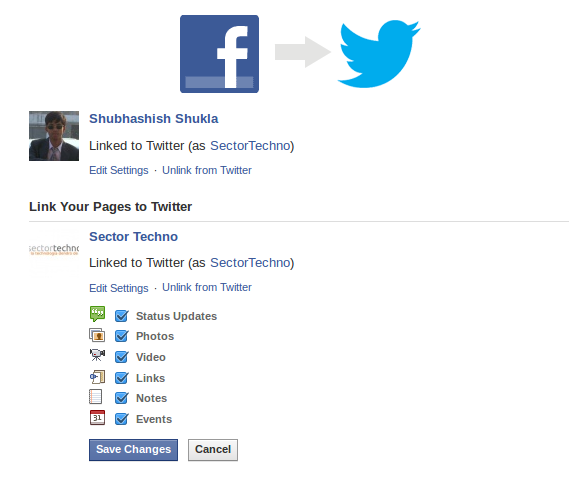 Authorize Facebook app with twitter. The URL that you posted will get shortened. Also see the 'hash tag'. While posting you status updates, if you are posting URLs then you might encounter dual URLs in your tweets as Facebook creates one more URL to display meta descriptions and thumbnails. Include 'hash tags' while posting status updates these 'hash tag' remain functional in tweets too. In case you want to mention somebody on twitter and you know the user-name then type the user name first and then add @ symbol. Facebook also supports this feature there are chances that a user or fan page with that user-name exists on Facebook too. i hope you are a brilliant blogger for this you left this post I am impressed to Visit your post Thats nice entry.I want to follow your blog post continue. You can see also this post.